Let’s hope the 2017 cars are as safe as their new tires are wide, because Formula One could get their very own crash test dummy back in the series. Venezuelan funbag of surprises Pastor Maldonado says he is in talks with several midfield F1 teams for a 2017 drive, reports WTF1. As always, talent means nothing in the world’s top open-wheel series when you’ve got cold, hard petrostate cash. I am discussing with some teams in the midfield and hope to be on the F1 grid in Australia. Obviously I do not exclude racing in other categories, but my priority is to race in F1. I’m talking to some teams and am quite optimistic. Unfortunately, circumstances pushed me out of the world of Formula 1, and you know getting back in through the front door is never easy, but we are working hard and I hope to have some good news in the coming weeks. 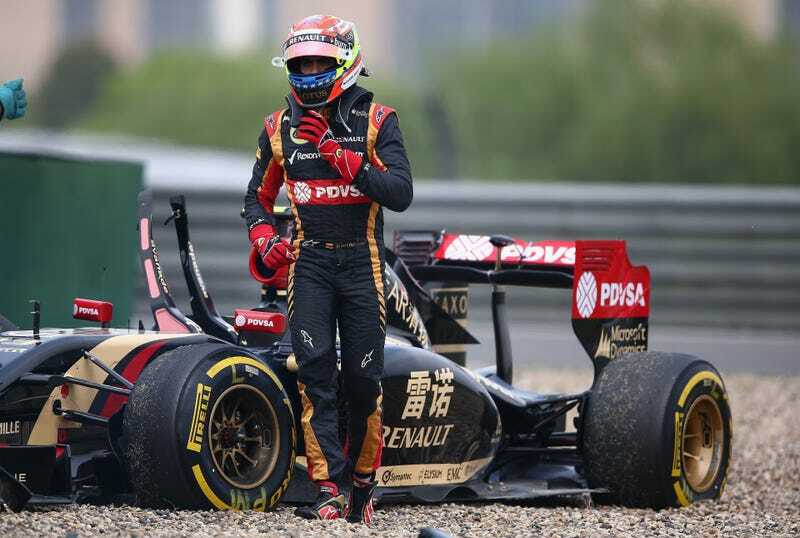 Maldonado lost his Renault seat for 2016 after deteriorating economic conditions in Venezuela dried up his the bank account of his sponsor PDVSA, the Venezuelan state-owned oil and natural gas company. Alas, it appears as though he’s secured a new round of funding somewhere, as fools are easily parted with their money. Or are they fools? I mean, the camera does always cut to the car that’s crashing. Think of the publicity you’ll receive on Maldonado’s car! Sponsoring the guy is practically a no-brainer. On a more serious note, however, he did gain experience testing the new-for-2017 Pirelli tires during 2016, and his possibly testicle-induced tendency to crash belied a decent record in lower series, including a GP2 championship in 2010. We here at Jalopnik know a holiday miracle when we see one. All we have to say here is “God bless us, everyone” in our best Tiny Tim voices. A miracle is upon us. Has Maldonado Crashed The Party Today?